Good morning everyone! It’s a beautiful spring morning here in Montana. One of the things I love most about Montana is how the fresh spring air smells – a little like snow (after all, spring in Montana is still pretty chilly), a little warmth, mountain air, trees, and sunshine. You roll it all together, inhale deep, and mmmm you’re ready for spring! Onto some spring nail polish combinations! 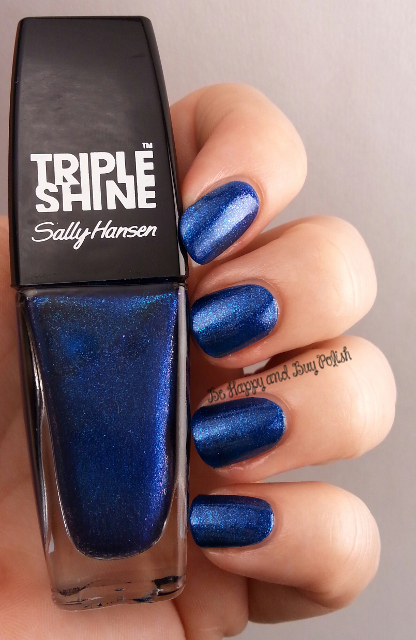 I have some Sally Hansen Triple Shine polishes today, 3 over Sally Hansen Xtreme Wear polishes. I’ll be showing you the Xtreme Wear polishes tomorrow. I’ve used OPI base coat with all swatches, and the only top coat I’ve used is when I’ve matte-fied with A Girl Obsessed Matte-ict. The two flakies were a bit sparse on the first coat, so I had to use two coats with those. The Hypnautical over the Violet Vintsgr was my super fav.But I loved the first one too. I HAVE JUST PICKED UP A COUPLE OF SALLY HENSEN POLISH.ITS A GREAT POLISH I LOVE THEM ALL HARD FOR ME TO PICK. Love the third one. That is gawgeous!!!! I love all of the Triple Shine polishes I’ve tried so far. I really like the color combinations! The only one I think I really want would be Triple Shine Wavy Blue cause it just looks so bright and pretty. However, I’m not that excited about it needing three coats. Still…I want it. I have issues. They are kind of fun – not as strange as some bottle shapes, LOL! I have a few of these SH polishes too. Pearly Whites is super pretty – I think I have five bottles of that one alone.